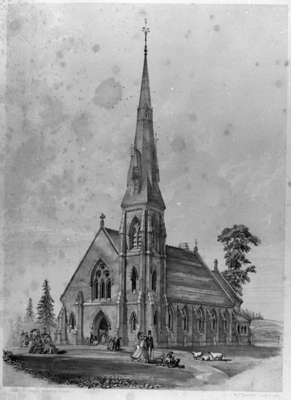 A black and white photograph of a lithograph of all Saints' Anglican Church. This is an artist's concept of what All Saints' Church would look like, complete with churchgoers in their Sunday best clothes, and sheep grazing on the lawn. All Saints' Anglican Church was built in 1865-66 at 300 Dundas Street West on the north-west corner of Dundas and Centre Streets. This lithograph was from a drawing by Toronto architects, Gundry and Langley. All Saints' Anglican Church, 1865, W.C. Chewett & Co. Whitby Archives 09-002-001.